Menopause is most often associated with symptoms such as hot flashes, night sweats, and mood swings. However, these are not the only symptoms of menopause. It can sometimes difficult to know if you are having menopause symptoms, or if what you are experiencing is attributable to another medical condition or circumstance. Menopause can cause a wide range of lesser known symptoms, including weight gain, tingling extremities, and itchy skin. The earlier symptoms of menopause can be a combination of better known and lesser known symptoms. Are My Symptoms a Sign of Early Menopause? Am i within the typical age range of menopause? Most women go through menopause between the ages of 45 and 55 years old. 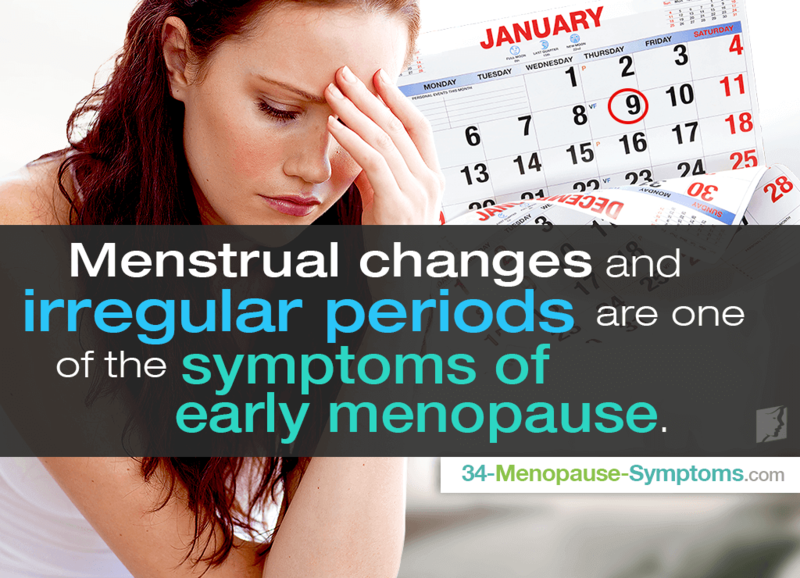 If you are between these ages and are experiencing menopause symptoms, you could be beginning the menopause transition. However, keep in mind that it is possible to go through menopause later, and many women also go through menopause earlier as a result of certain medical conditions or surgeries. Am i the same age my mother was at menopause? Most women will go through menopause around the same time as their mother and grandmothers. Talking to your mother and other female relatives can help you figure out when you are most likely to go through menopause, what symptoms you will be most likely to experience, and what treatments worked for them. Menstrual changes and irregular periods are one of the earliest menopausal symptoms, and menstrual changes can be caused by a decrease in estrogen levels, a major part of menopause. Has my overall mood changed? As estrogen levels being to drop, menopause symptoms like irritability and anxiety can occur. Many women experience emotional changes that are caused by hormonal shifts during menopause. All typical menopause symptoms - such as hot flashes, night sweats, mood swings, and vaginal dryness - could be a symptom of an underlying medical condition and unrelated to menopause. If you are concerned and think you have an underlying condition that is not connected to menopause, it is a good idea to see a doctor. The most common and effective treatment for the major menopause symptoms is hormone replacement therapy. Herbal remedies, meditation, and antidepressants have also helped many women. Talk to your doctor to find a treatment that fits you and to learn about the risks and benefits of each method. Click on the following link to learn more about treatments for early menopause symptoms.